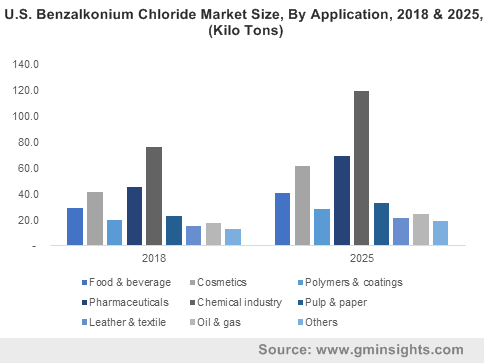 Benzalkonium Chloride Market size was over USD 605 million in 2018 and industry expects consumption at over 400 kilo tons by 2025. Growing disposable incomes, changing lifestyles and rising demand for sun & skincare products owing to exposure to adverse climatic conditions is likely to accelerate growth of benzalkonium chloride market size. This product finds extensive usage in the manufacture of skin cleansers, shampoos, eye makeup and personal cleanliness items. Global cosmetics market size was valued at over USD 220 billion in 2018, which indicates ample market growth potential. This product plays a crucial role in preventing growth and proliferation of microorganisms in cosmetic products and acts as a detergent and foam booster which is likely to promote market growth. Booming microelectronics, oil & gas and mining industries is likely to boost regional water and wastewater treatment market growth and stimulate benzalkonium chloride demand. Global oil & gas market size was valued at about USD 2.3 trillion in 2018, which indicates tremendous demand for water treatment and market growth. This product acts as a cationic surfactant making it highly adsorptive to negative ions such as sediment, clays, sulfides, sulphates, halides and oxides found in sewage systems. Significant population growth, rampant industrialization and widespread pesticide usage has severely affected freshwater quality in the region which is likely to further accelerate wastewater treatment market growth and increase product demand. Exposure to benzalkonium chloride may have various side effects such as skin irritation, eye corrosion thereby leading to dermatitis and further restraining benzalkonium chloride market growth. Long-term use of products containing such ingredients can lead to the proliferation of resistant bacteria in food processing facilities, hospitals, farms and households, further hindering market growth. Global BAC 50% market size may witness gains close to 5% up to 2025. This product finds widespread usage as a disinfectant, antiseptic and preservative in ocular drugs owing to its germicidal nature and surface cationic properties in polymerization reactions. This product exhibits excellent anti-infective properties which make it ideal for hygiene products which should further stimulate market growth. 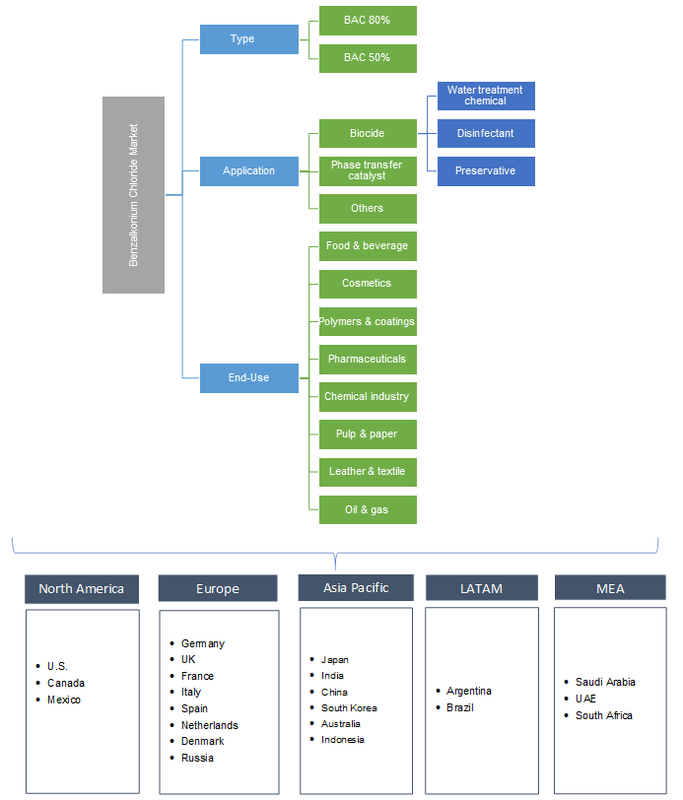 Global benzalkonium chloride 80% market size surpassed USD 450 million in 2018 owing to its extensive adoption in leather, sugar, pulp & paper, industrial water treatment and aquaculture industries. The product’s excellent antibacterial properties increase its suitability for chemical, dairy, food & beverage, household, and horticulture disinfectant products. It exhibits significant toxicity against fungi, algae and enveloped viruses which should increase product demand for oilfield applications. Benzalkonium chloride market demand from disinfectant applications in biocide is likely to register gains over 6% in the forecasted timeframe pertaining to its extensive use in the sanitisation of dairy & food processing equipment and public eating outlets. The product offers the advantage of destabilising pathogen surfaces by forming electrostatic bonds with negatively charged ions on pathogen surfaces owing to the presence of a hydrophilic cationic group, thus stimulating product demand. Phase transfer catalyst applications exceeded USD 125 million in 2018. This product finds widespread usage as a phase transfer catalyst and precipitant owing to its ability to localise air/water and oil/water interfaces. This product is also extensively used in the manufacture of organic compounds by stimulating interphase species transfer which is likely to accelerate market growth. Food & beverages end-use is likely to surpass USD 100 million up to 2025. This product is routinely used to manufacture cleaner-sanitizers and disinfectants which find use in the food, dairy, livestock and hospital. These products modify microbial cell proteins and deactivate essential enzymes which restrains microbial contamination further boosting product demand. Benzalkonium chloride market from polymers & coatings end-use should register over 5% gains in the predicted timeframe. This product is extensively used as an emulsifier, preservative and antistatic in the manufacture of coatings for the paints, electronics and wood treatment industries. Moreover, this product finds wide use in coating biomedical surfaces to reduce the prevalence of hospital associated infections which should promote market growth. North America, driven by Canada, Mexico, and the U.S. market size should surpass USD 270 million by 2025. Improved sales opportunities for U.S. and Canadian oil field equipment manufacturers along with an impending overhaul of Mexican refineries should boost North America oil & gas market growth and boost regional industry growth. This product is vital in the oil and gas industry to prevent the generation of toxic hydrogen sulfide gas by microbial growth thereby reducing the possibility of corrosion & stress cracks and stimulating product demand. Europe benzalkonium chloride market size led by Germany, UK, and France, surpassed USD 125 million in 2018. It is extensively used as a preservative in various pharmaceutical formulations such as ocular medications and the manufacture of lozenges for treating superficial mouth and throat infections. Increased technological innovations in the healthcare sector has led to significant improvement in treatment outcomes and medicine development which should stimulate European pharmaceutical market growth, further increasing product demand. Asia Pacific driven by India, Japan, and China market size is likely to expect gains at above 6% by the end of foreseeable timeframe. Booming papermaking, manufacturing, pharmaceutical and pesticide industries is likely to boost regional water and wastewater treatment market growth and thereby stimulate product demand. The product is highly effective in minimising the growth of algae, slime mold, molluscs, and fish pathogens which should increase product demand for wastewater treatment. Global benzalkonium chloride market share is consolidated among several participants such as Novo Nordisk, Jinshan Jingwei Chemical, Merck Millipore and Dishman Group. Major manufacturers are focusing on developing new products to expand their product portfolio and strategic acquisitions to enhance their manufacturing capabilities. Benzalkonium chloride (BAC) is an antimicrobial agent extensively used as a preservative in several pharmaceutical formulations majorly for ears, eyes and nose. These quaternary ammonium compounds perform the role of detergent by destroying cell membranes and eliminating microorganisms. Rising industrialisation, population growth and increased focus of manufacturers to comply with wastewater disposal regulations are likely to accelerate market growth.